Mason-Dixon Line established as Maryland's northern boundary. The line is traditionally thought of as the division between America's North and South. Fort McHenry; Francis Scott Key writes the "Star- Spangled Banner"
Chincoteague's are the famous ponies from Assateague Island. A woman may not go through her husbands pocket while he is asleep. In Halethrope, kisses lasting longer than one second are illegal. In Baltimore - It's illegal to take a lion to the movies. The state of Maryland is located in the Mid Atlantic section of the United States is bordered by the District of Columbia, West Virginia and Virginia to its south and west, Pennsylvania to its northern border, and Delaware to the east. Maryland is the 9th ranked smallest state in regards to land area with an total area of roughly 12,400 square miles and is the 5th ranked most densely populated state. The highest populated city in the state is Baltimore and the state capital is Annapolis. 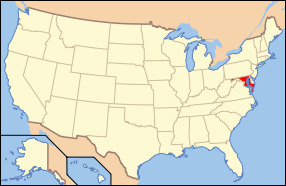 The overall geography of the state of Maryland is quite diverse and consists of a large variance in its overall topography, and was thus given the nickname “America in Miniature”. Everything from sandy dunes to marshlands, to rolling hills and pine groves can be found at one point or another within the small state borders of Maryland. In addition to the wide variety of geography, the state also experiences a wide range of climates mainly due because of its variances in elevation and the fact that is is in close proximity to water. Much of the eastern part of the state sits on the Atlantic Coastal Plain which consists of a flat topography along with sandy or muddy soil. This area has a humid subtropical climate that experiences hot and humid summers with short and mild winters. Maryland has several major thriving industries that help solidify the states overall economy. One of the main industries is farming which primarily consists of corn, tobacco, soybeans, poultry, and dairy. Other important industries within the state are coal mining, communications, steel products, governmental services, and fishing (primarily crab and oysters). There are several major bodies of water in Maryland such as the Potomac River, Patapsco River, Susquehanna River, Patuxent River, Deep Creek Lake, Prettyboy Reservoir, Lake Oakland, and Loch Raven Reservoir. The highest point of elevation in the state is Black Mountain which sits 3,360 feet above sea level. The state bird in Maryland is the Baltimore Oriole, the state fish is the Striped Bass, the state flower is the Black-Eyed Susan, and the state tree is the White Oak Tree. The state of Maryland may be small in comparison to many of the other states within the country, however it is much more diverse geographically unique than many of the other states which makes it a prime attraction for people of all backgrounds. Maryland's 23 rivers and bays combine with more than 400 miles of water tributary to the Chesapeake Bay, and coastal bays. To and from the Atlantic Ocean, some 35 miles of water are accessible.